This index has been taking from the old site (https://poetryintoprose.wordpress.com) and will be transferred to this website in time. Some links refer to the old site, others to this site. “London” turned into a diary entry by Gijs van Iterson. “London” turned into a news article by Anonymous. “Remembrance” turned into a letter by Sterre Weststeyn. “No Coward Soul is Mine” turned into a prayer by Anonymous. “No Coward Soul is Mine” turned into a diary entry by Anonymous. “She walks in Beauty” turned into a diary entry by Aranka van der Post. “I Hid my Love” turned into a diary entry by Anonymous. “I am!” turned into a letter by Aska Hayakawa. “The Dying Child” turned into a eulogy by Anonymous. “Robin Hood” turned in to a political speech by Abel Pleij. “To Autumn”, turned into a diary entry by Anonymous. “When I have fears that I may cease to be” turned into a letter by Anonymous. “Annabel Lee” turned into a letter by Simone Flipse. “The City in the Sea” turned into a travel journal by Anonymous. “The Haunted Palace”, turned into a story by Anonymous. “Ozymandias” turned into a letter by Anonymous. “Ozymandias” turned into a diary entry by Anonymous. “Ozymandias” turned into a story by Wouter Kroon. “Time”turned into a reflection by Anonymous. “Oh Captain, My Captain” turned into a speech by Pieter Goossens. “On the beach at night alone” turned into a letter by Anonymous. “I Wandered Lonely As a Cloud” turned into a diary entry by Anonymous. “I Wandered Lonely As a Cloud” turned into a reflection by Anonymous. “I Wandered Lonely As a Cloud” turned into a letter by Anonymous. “The World is Too Much With Us” turned into a reflection by Anonymous. “Speak Gently” turned into a reflection by Zaël J. Maipauw. “My Last Duchess” turned into a letter by Merel Smeets. “Prospice” turned into an interview by Stijn Jongeengelen. “Jottings of New York: A Descriptive Poem” turned into a travel brochure by Bas Bouman. “The Lady of Shalott” turned into a fairy tale by Anonymous. “The Lady of Shalott” turned into a letter by Loes Versteeg. “The Lady of Shalott” turned into a diary entry by Anonymous. “(Extract from) The Ballad of Reading Gaol” turned into letter by Roderick Peul. 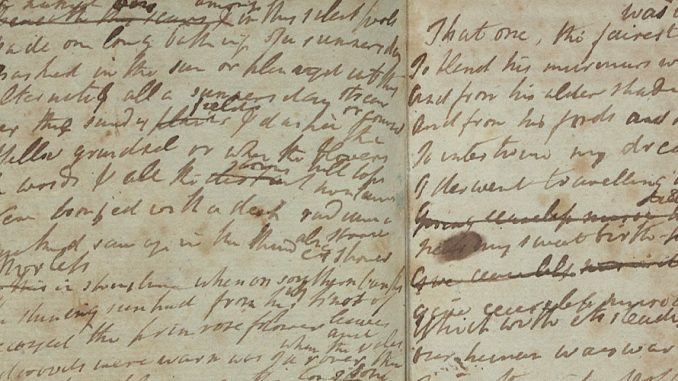 “(Extract from) The Ballad of Reading Gaol” turned into diary entry by Anonymous.